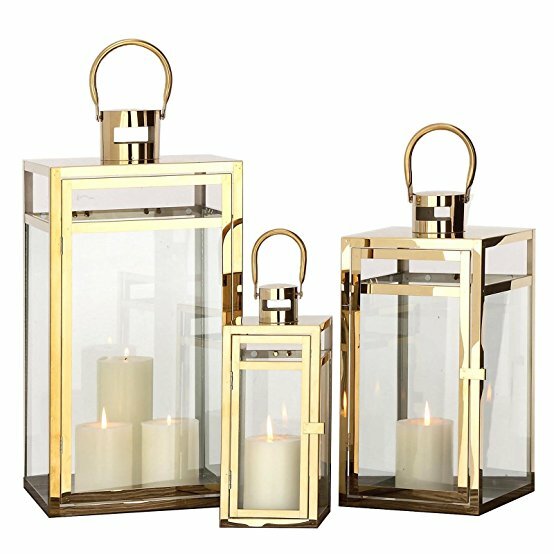 As you may know, blue & gold has been one of my favorite combinations this year and when I came across these gold lanterns on clearance I nearly passed out. My youngest and I grabbed 2 and saw people looking at them as we walked out of the store like they were hungry 😯 . After we brought them home I played with them a little bit and had big plans of putting Christmas ribbon in each one and making the ribbon curl and swirl around inside the lantern. Well, sometimes things work out in your head, but not on the kitchen table. I gave up on that idea quickly because they looked very boring, and rather ridiculous. 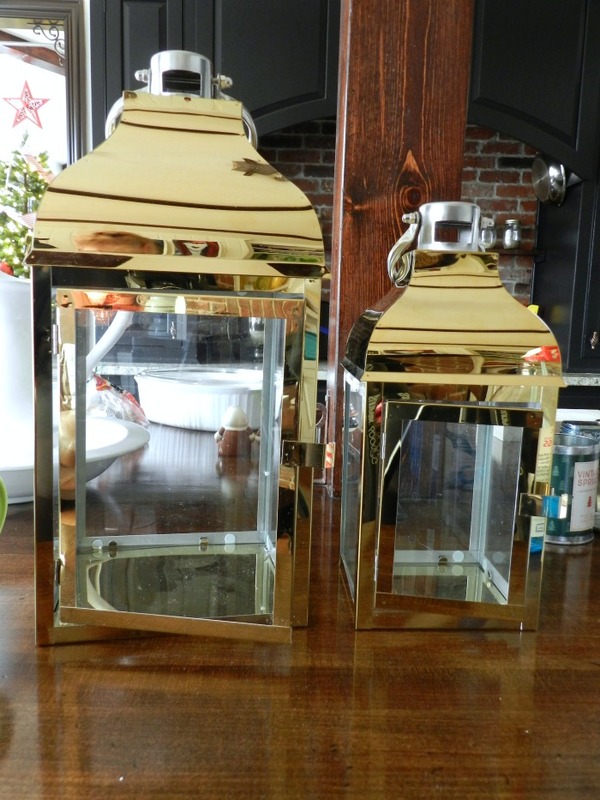 It was then that I walked around the house to find where to use the gold lanterns. Then I spotted my Mom’s special piano stool that I have been wanting to share. BOOM. Gold lightening came crashing down and my eyes did a dance down the stairs in the foyer. I had found the spot. Before we go any further, here’s what my Mom had to say about the piano stool today when I asked her about it again. My Mom is 83 and gave the stool to our youngest a couple years ago. I’m just borrowing it 😆 . Little does my Mom know, I spun around on that baby many many times. I even unscrewed the seat a couple times, stood on it and made it go back and forth, and polished those glass balls the feet are holding. Well, she knows now. 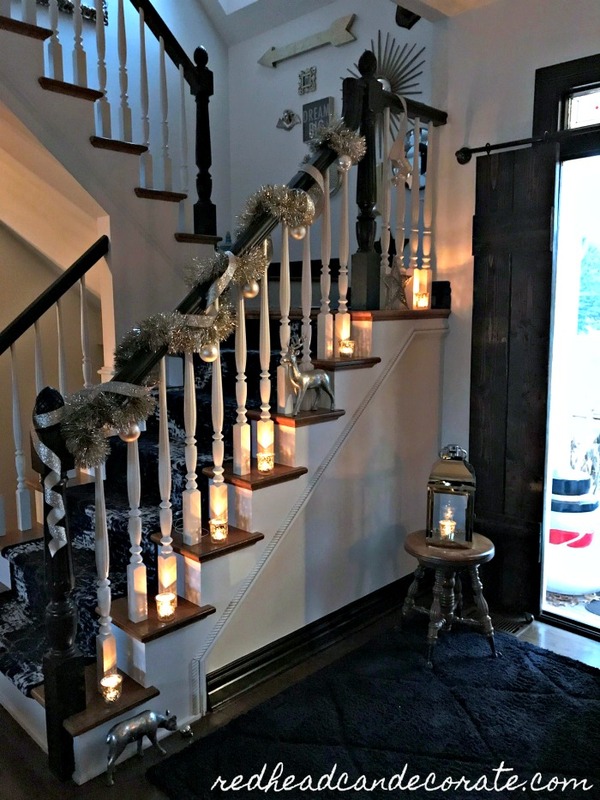 So, I knew I could whip up something festive with not only the gold lanterns, and that special stool, but also with the gold garland I had already purchased (garland is back you guys and I have always loved it). Now if you try this, don’t worry about making everything look perfect. I purposely messed up the garland & ribbon to give it a more relaxed look. Not sure I accomplished that, but it’s pretty for sure. Wait till Mom gets to see this, she will love it, Dad in NY ps she is taking a nap now will show later. I use it every year on tree or trimming a doorway. I love your ideas!! Mom loves it, its a great story, love, Dad in NY. Julie, I love the gold, I’m thinking adding clusters (groups of three) in royal blue to the garland. I just love it!!! Beautifully rich looking.. going to get out my piano stool today!!!!!!! Carol, do you have the same one??? ? Love the blue and gold. So pretty! Thank you, Vickie! Stay tuned for something totally different in the family room. Happy Thanksgiving ? Beautifully decorated Julie. 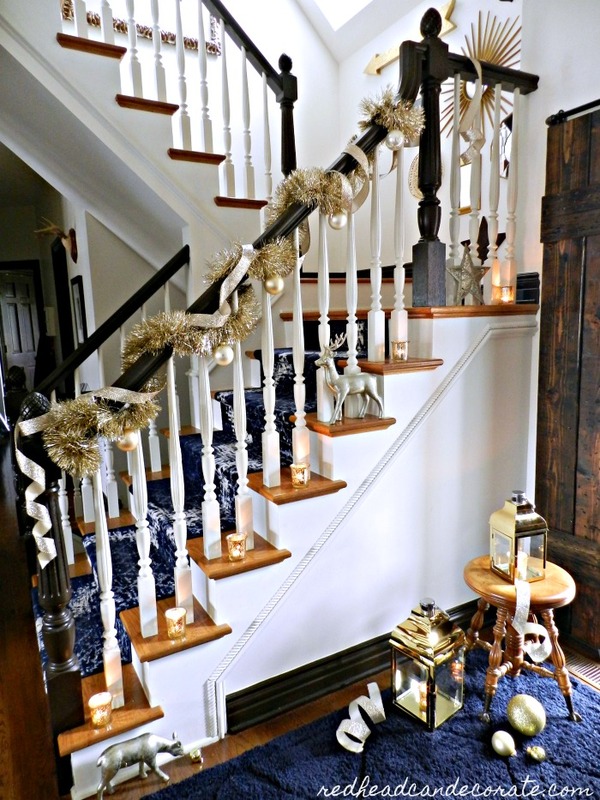 Love the gold and ribbon on your staircase; very casual and relaxed looking. 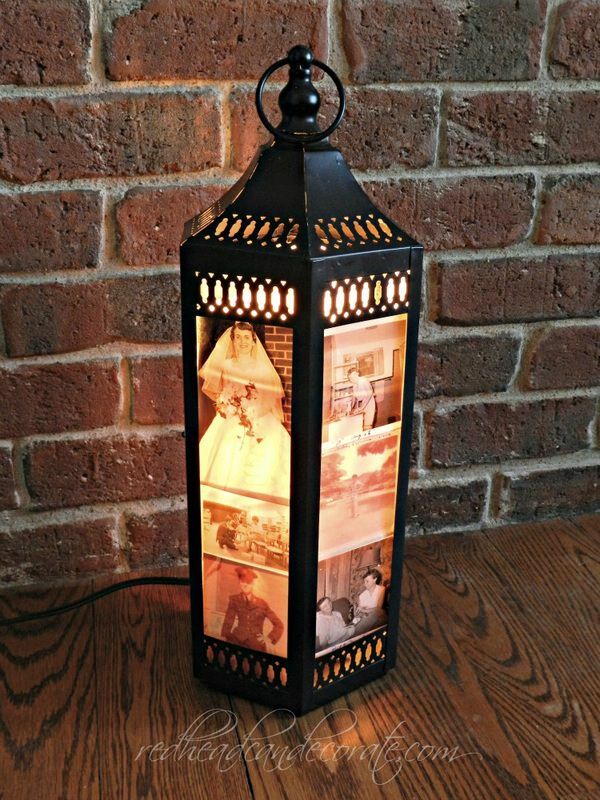 Those lanterns are stunning and makes for lovely setting along with the old piano seat. You need to keep exactly what your mom wrote to you about that piano stool, put in small ziplock bag or have it laminated and attach to the bottom of that antique stool. Always nice to have a bit of history on such items like that. 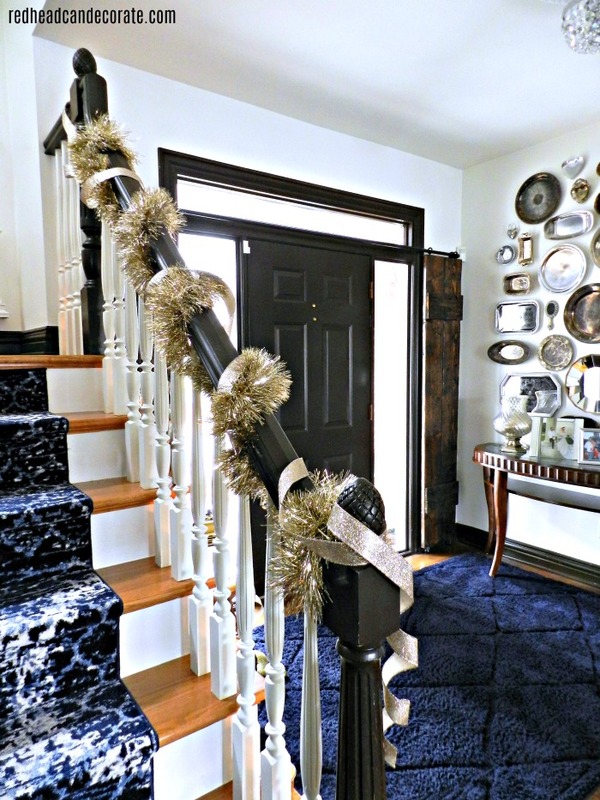 Thanks for sharing your beautiful decorations as I have been waiting for you to post pictures of your holiday décor. Hi Colleen! I’m doing a completely different theme in the family room. Lots of red and a new tree. Happy Thanksgiving!! Sweet! 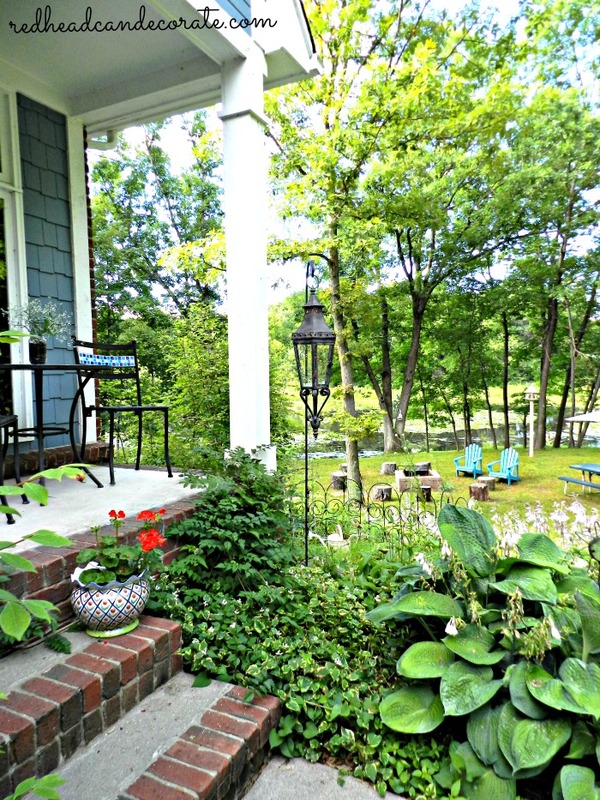 I love the purposefully relaxed look and so darn homey. I agree with you 100%, do what makes YOU happy! Hi Christina! Happy Thanksgiving ? Beautiful. 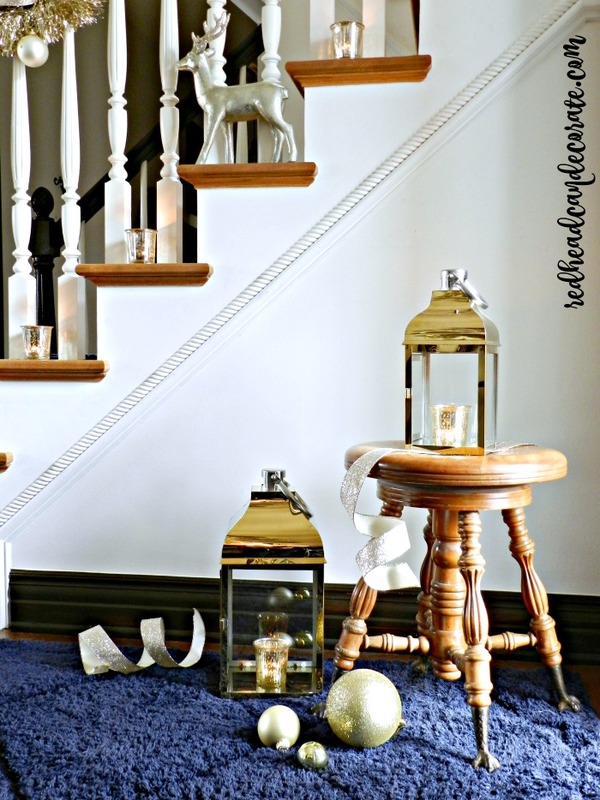 I love the way the blue color brings out the gold color and the way the candles give it that beautiful cozy look. The lanterns are really beautiful. Thank you for sharing them. God Bless. I love the relaxed look, I never have everything look perfect. I also start decorating a little early, Christmas is my favorite time of the year. I love the memories of the piano stool:-) Happy Thanksgiving to you and your family! 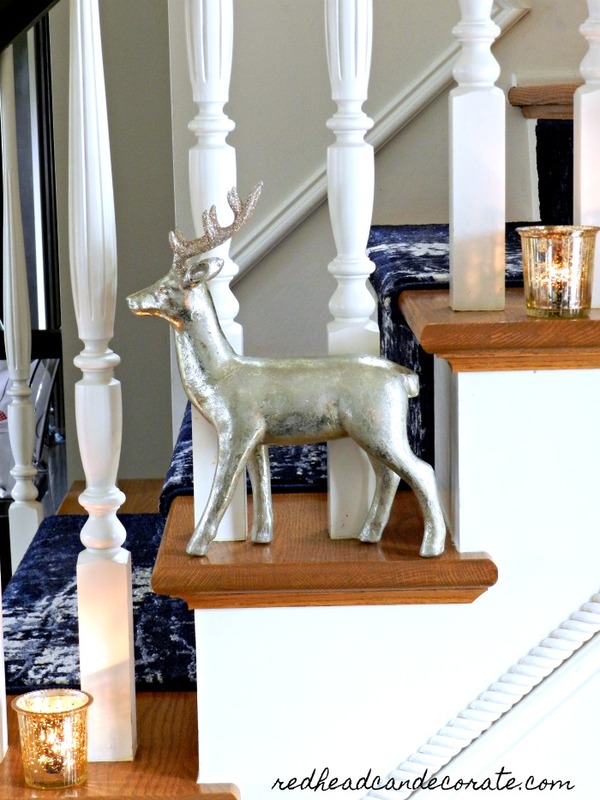 Love your decorating. Most of all, I loved the story about you and your moms piano stool. I Just now hearing funny stories from my children that are 40 and 37. They were a bit sneaky while mom was at work. Maybe not funny then, when you find something broken, but those two crack me up. Your girls are lucky to have such loving grandparents. Happy Thanksgiving and thanks for your site.? ???? My Mum was a collector and had this little piano stool with the claw feet, but it had no seat. My handy guy husband said he would make a seat and we painted it with a pretty blue. I think I will get a lantern and do what you did, so pretty. Cute story, Bette! I’m very surprised at how many folks had a piano stool. I thought we were the only one ??? 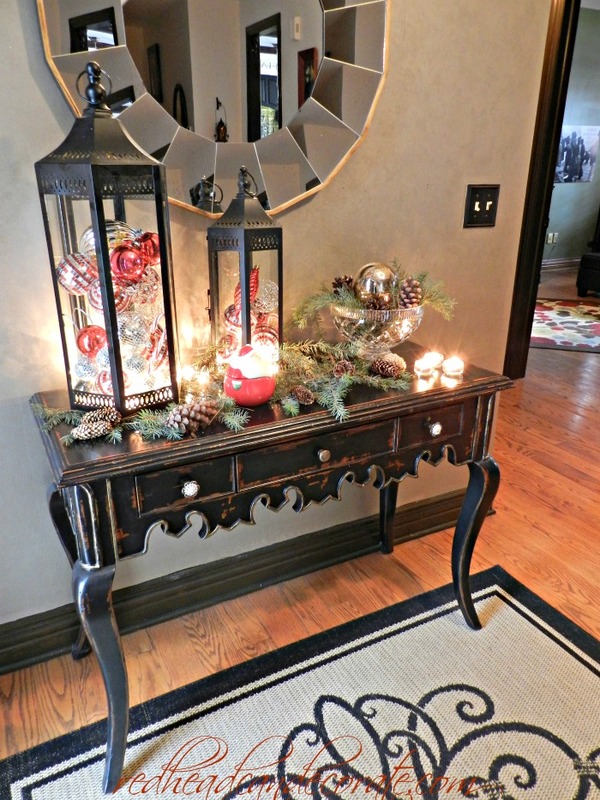 Always love seeing how you decorate Julie,you have a great flair for it. 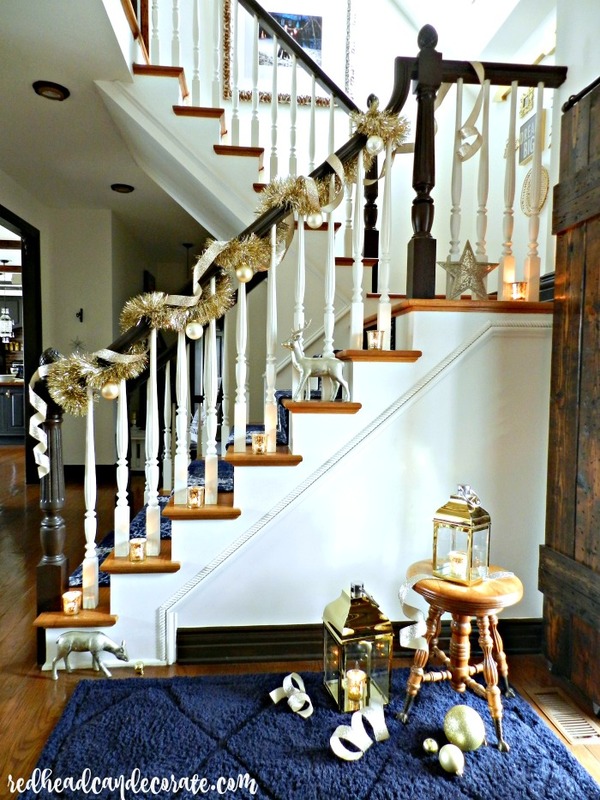 Seeing your gorgeously decorated stair well makes me wish we had stairs also. I am so in awe of those fantastic gold lanterns,oooohhhaaaaahh. Buying something besides what I really love doesn’t quite satisfy me any longer but will just have to do.Think there might be few things in my life more important ya’ think?,lol. Being married to a wonderful man for 49 yrs. come 11/30 just might be one of the best.